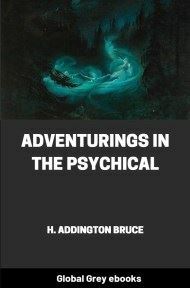 Chapters include: The Lesser Crystalline Sphere; The Greater Crystalline Sphere; The Universal Crystalline Sphere; A Consideration Of The Ancient Methods; Further Considerations - The Methods Of Dr. Dee And Sir Edward Kelly; The Attainment Of Crystal Vision; and, Of The Ultimate Crystal. 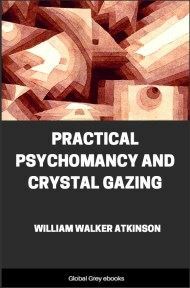 The study of Crystal Gazing without a Crystal would appear very much like the study of a "Bill of Fare" without troubling to obtain the material food described thereon. The mere reading of a book on a subject of this nature without an attempt to put into practice the processes described -- step by step -- from the very beginning, is futile and a mere waste of time. The first consideration, therefore (if the would-be seer has not already attended to the matter), will be the choice of a suitable Crystal to form the material basis of his experiments and a stepping-stone to the development of his latent powers of clear vision. In all probability the aspirant to this ancient art has already been attracted to a Crystal Sphere of this nature, for there is little doubt of the extraordinary magnetic attraction of objects of this kind whenever they are exposed to our view, and since the present interest in this fascinating subject has become apparent, we may see these Crystals displayed more publicly than has ever been the case in the past. 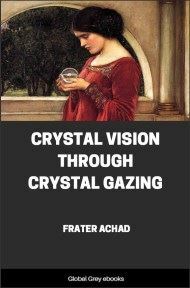 In olden times, and even up to the last few years, crystals were the cherished possessions of those well advanced upon the Path and kept by them from the eyes of the so-called profane. Only after having found the way, often with difficulty, to the presence of these Seers, did an opportunity occur to get even a glimpse of such a magical link with the invisible spheres. Fortunately for the modern aspirant, however, this difficulty has been removed and it has been found that more good may result by a proper study of this science so as to develop one's own latent powers, than ever a mere visit to a Seer could produce. Man has made a considerable advance on the road to Attainment. Self-development and self-initiation are beginning to play a much more prominent part than formerly. Man is no longer content to believe what he is told, he at last desires to know from his own experience. The Crystal is a stepping-stone towards Self-knowledge. We should select our crystal with great care; the more perfect its quality, the more we should desire it as the means of our development. It should be neither too large, nor too small, and here our natural intuition should be allowed to guide us, but I may say that it is not well that the Sphere be less than two and one-half inches in diameter, and it is not necessary that it be more than four. We should choose this crystal, I might almost say, lovingly; at least, if a selection is presented to us we should take the one to which, after a moment of silent consideration, we feel most attracted; and this -- if possible -- regardless of the material consideration of its cost. We should not, however, purchase a globe which is far beyond our material means, so that other obligations would suffer thereby; otherwise, lurking at the back of our consciousness whenever we use it, may be the feeling of having acted wrongly in that connection from the very start. We must realize the importance of this advice, for the great attraction that the Crystal has for us is something more than the arousing of a mere idle curiosity on our part. It is no less than a desire -- subconscious it may be -- to attain the same purity of soul that we perceive in the Crystal before us, and, as a matter of fact the results we obtain by a study and practice of this Art will largely, if not entirely, depend on the purity of our desire and the quality and state of development of our inner nature. That is why I am taking up the material consideration first of all, for after the crystal has actually come into our possession, our path lies away from such considerations, at least until we have attained the success which will surely attend our earnest efforts in the right direction. Let us suppose then that the first step has been taken, a suitable Crystal has been obtained, and that the possessor has taken it into his own room -- the one he likes best and wherein he feels most contented and serene. The choice of this room is also of importance, though in this case we must make the best of what is at our disposal. If possible this room should be one wherein we have never had any particularly unpleasant experience, where there is nothing that we feel antipathy towards, and wherein are such objects as we love best of all our possessions. In such an atmosphere the soul of the seer will feel at peace, free from distractions, and consequently in the right mood to commence his studies. The Crystal should first be taken in both hands and held for a few moments while we close our eyes and, calming the mind, raise our consciousness to the highest and purest Ideal of which we are capable. We should persist in our effort toward this state until we feel that holy calm and stillness, so well symbolized by the Crystal itself. We should next turn our attention to the crystal, separating the thumbs slightly, thus allowing it to rest easily in the hollow of our hands. We should remember that we, too, rest thus in the Hollow of the Hand of the Almighty without Whose aid, our Work must come to naught. As we look into the depths of this Globe -- material though it be -- we cannot but be impressed with ideas of Purity. It is almost as if we gazed into the eyes of a little child, and there are few who have not experienced a peculiar sensation, almost amounting to awe, certainly one of wonder, when so doing. The soul of the seer is very like that of a little child -- or should be -- and it is in order that we may regain the purity and perfection of this child-like vision that we set out on this path. Most of our material surroundings give us a certain feeling of grossness, few, if any, can compare with the lucid depths of the crystal now before us. But, in entering this path, we are about to deal with ideas and forces, finer and less apparent to our ordinary senses than any we have yet known. Even the transparent crystal is not as yet entirely pure, though we may be unable to perceive one spot on its surface or within its depths.